I remember the first time we ate at Reata in Alpine. We still lived in Boerne and had just spent a few nights camping down at the Rio Grande Village in Big Bend National Park. In a tent. We were headed up to the Davis Mountains State Park for another night or two of camping before returning to the real world. We stopped at Reata to eat food that wasn’t cooked outside on a camp stove, or ready-made salads packed in the ice chest, before our next leg of tent-camping began. While we waited for our food, we chatted with a family at the table next to us. They looked weary, and I casually asked if they too were camping. Nope, not camping, but they had just started their family vacation with a 13-hour train ride from San Antonio. As we talked, it turned out we knew some of the same people and that his friend had just bought my dear friends’ mother’s home in Boerne. West Texas is such a small world. The word “reata” is Spanish for “rope.” The Reata Restaurant is named for the stately ranch in the 1950’s movie “Giant,” starring James Dean, Rock Hudson and Elizabeth Taylor. The movie symbolizes the strength, spirit and excitement of the days of the wide open spaces of the west. According to the menu and website, the first Reata Restaurant started when a West Texas rancher “had a hankerin’ for some really great food.” Al Micallef, owner of the CF Ranch, took matters into his own hands and partnered with Fort Worth businessman Mike Evans. Together, they opened the first Reata Restaurant in Alpine in 1995, and the second Reata in Fort Worth in 2002. We’ve eaten at Reata many times, and while I like to try new things, I usually end up going back to my favorite dish – Fried Chile Relleno stuffed with Cream Cheese, Corn and Peppers. I love cutting into the crispy fried relleno and watching the creamy corn and pepper filling slowly spill out onto my plate. It’s so delicious that I can’t even describe it. 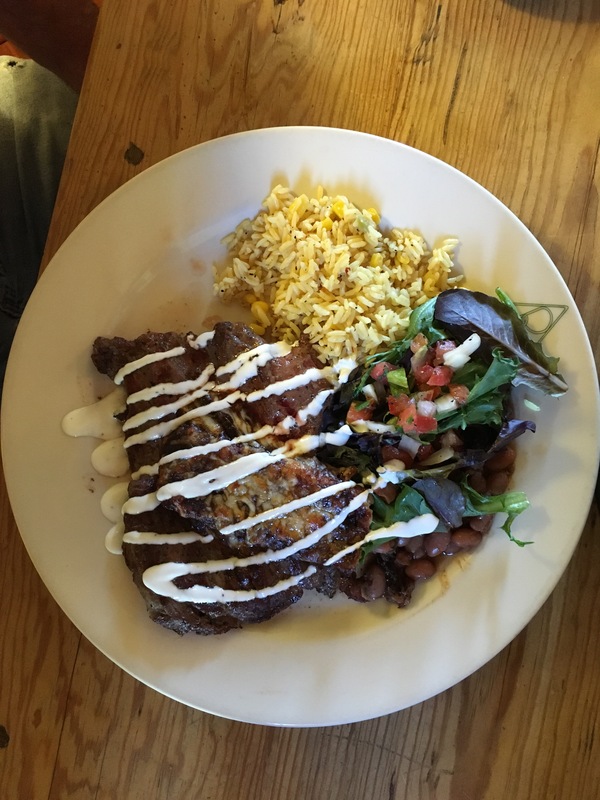 My husband has several times ordered the Carne Asada with Cheese Enchiladas, as well as the Chicken Fried Steak with Cracked Pepper Cream Gravy. Last Saturday, I tried something different, and I think the chile relleno now has competition for my favorite meal. 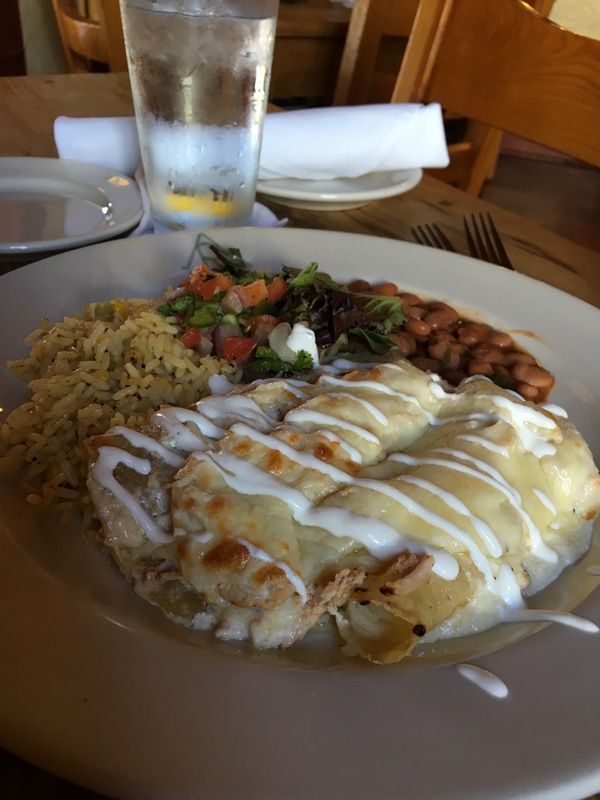 The Sour Cream Chicken Enchiladas with Rice and Beans were simply delectable. I will be ordering that meal again. My mouth waters just thinking about it. Grease a 9X13 inch baking dish and set aside. Preheat oven to 350 degrees. In a mixing bowl, combine chicken and 1 cup of Monterey Jack cheese. Fill tortillas with this mixture and roll each one up then place seam side down in buttered pan. Melt the butter in a skillet and sprinkle flour over melted butter and whisk to combine. Cook for 1 minute. Remove the skillet from heat and whisk in broth. Place back on heat and cook until the mixture has thickened and is bubbly. Cool sauce for 3-5 minutes (If the sauce is too hot and you add the sour cream it will curdle so let it cool!). Add sour cream to cooled sauce, and then add chilies. Stir until sauce is smooth and sour cream is completely blended. Pour sauce over enchiladas and add remaining cheese over top. Bake in preheated oven for 20-25 minutes or until enchiladas are heated through and sauce bubbles. Broil until top is nicely golden. Top with chopped green onions and serve. 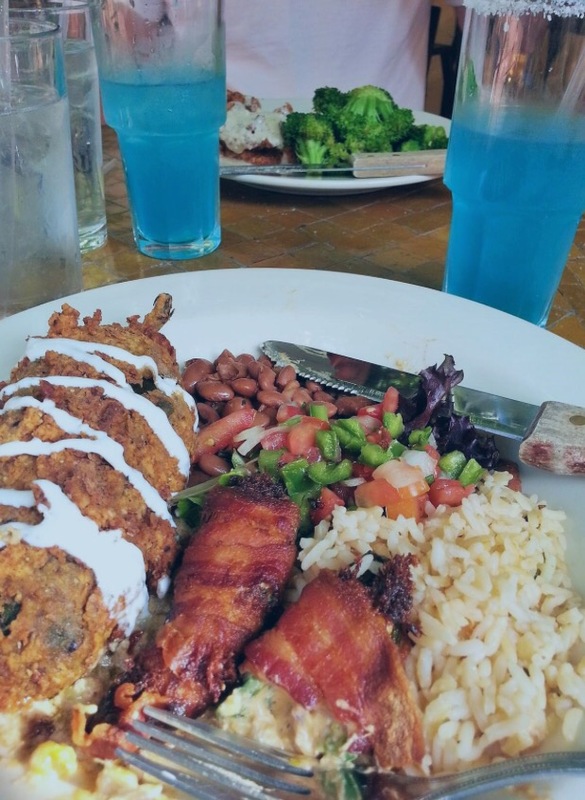 Blue Margaritas, Chile Relleno with Bacon Wrapped Shrimp, and his Chicken Fried Steak with steamed veggies in the distance.